Casseroles. They save me time and time again. I love making dinner ahead of time. I slice and dice veggies, cook pasta, roast veggies, anything I can do to make dinner time easier with two little ones works great for me! Some days I’ll prepare a few things during nap time or I’ll even put a whole casserole together during the day so when my husband is on his way home from work I pop it in and I can spend some good quality time with my family. Dinner is all about family right? This week the Sunday Supper family is bringing all the casseroles you will need to the dinner table! From breakfast casseroles, casseroles to serve as appetizers to main dishes and desserts! This amazing event is being hosted by Alice of A Mama, Baby & Shar-pei in the Kitchen. A special thank you to the host! Though my kids are young I still like making special snacks and dinners for holidays and special occasions. A new thing I’ve been starting is having different themes at night for dinner. My oldest is four so she isn’t going to understand what “Italian Night” is or “Mexican Night” however I’m starting to talk about it with her. I love trying new dishes myself so eventually my kids can learn not just what other cultures eat but about other cultures in general. I like to make Chinese food at home because it’s a favorite of ours but who likes to feel that bloated full feeling after you eat take out? Not I. I was also secretly hoping that my kids would eat some of the vegetables as they munched on the Chinese noodles. Well it was wishful thinking. When I tried to sneak a bite of past into my sons mouth with a pepper in it he spit it out, took the pepper out of his mouth and returned to munching on the noodles. Oh well I tried. I thought it was a super easy dish to make, I prepared it during the day and popped it in the oven right before my husband got home from work. I wanted the sauce to be thickened so I used the normal cornstarch and mixed it with beef broth. After I researched a few dishes I noticed that a lot of Chinese food sauces have a large amount of sugar in them believe it or not. I think a small amount of soy sauce and sesame oil can go along way! I’ve actually made this dish before, however I wanted to save myself the sautéing and cooking of the vegetables, we all know that carrots can take forever to cook. So baking it as a casserole did just that! Instead of standing by the stove waiting for carrots, celery and peppers to soften I got to sit with my family. In a microwavable safe dish add the carrots, celery and a dash of water, cover and microwave for 2 minutes. 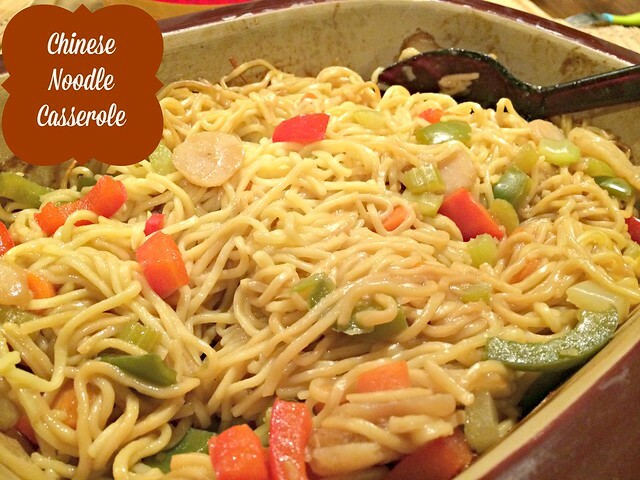 Cook Chinese noodles according to packaged directions, drain and place in a 9x13 inch baking dish. In a medium sauce pan heat soy sauce, sesame oil, brown sugar, chinese rice wine, water and ginger and bring to a boil. In a separate dish whisk the beef broth and cornstarch together. I actually use a small mason jar and shake. Add the beef broth mixture to the boiling mixture and continue to whisk. Bring to a boil and allow sauce to thicken. Meanwhile combine the carrots, celery, peppers and water chestnuts to the noodles. Once the sauce thickens to your liking pour the sauce over the veggies and stir to combine. If your not cooking right away leave the casserole out and mix throughly again before putting it in the oven. Preheat Oven to 380. Bake covered for 40 minutes. Sprinkle green onions over top and serve. Well it was a big hit even though the kids picked the veggies out. Eh, you can’t win them all right? I loved it because I always love when a dish is full of veggies since I love just about all of them. My husband said it made an awesome leftover dish at work the next day. And my daughter gave it a ………….. Put one of these Captivating Casseroles on your table this week! So true about how so many Chinese dishes have too much sugar and sodium too. I like how you made it healthier and tasty too. I’d eat your children’s share of vegetables! Your Asian inspired casserole sounds terrific! I love this casserole. Thank you. 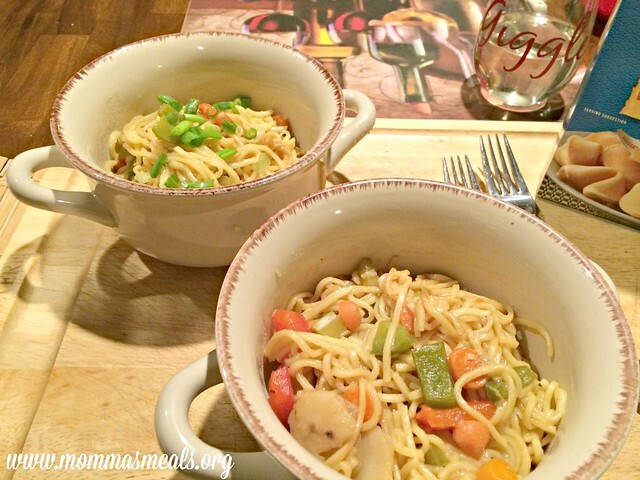 We LOVE Chinese food at home and I think this delicious recipe would be a HIT with my kids! LOVE IT! I LOVE making Asian at home. It’s definitely so much healthier and tastier. LOVE this! This is such a convenient way to make lo mein — so versatile! I love making take-out type Chinese food at home too. I agree with you about avoiding that yucky bloat – ick! This looks fantastic and really healthy! This looks wonderful! 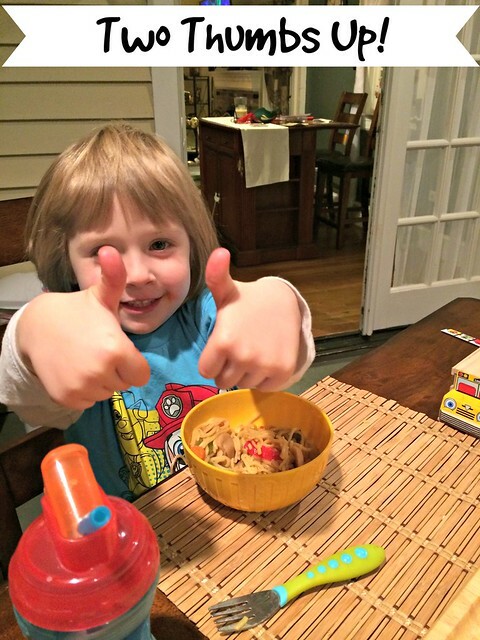 I especially love the pic of the cutie with two thumbs up! Beautiful dish! I have been having a huge Chinese craving lately. I love that you turned it into a casserole. I hope they don’t pick out the veggies like my little buggers did lol!! Its like a stirfry and casserole in one! I love Asian-inspired dishes like this one. Great idea! My kids would devour this! 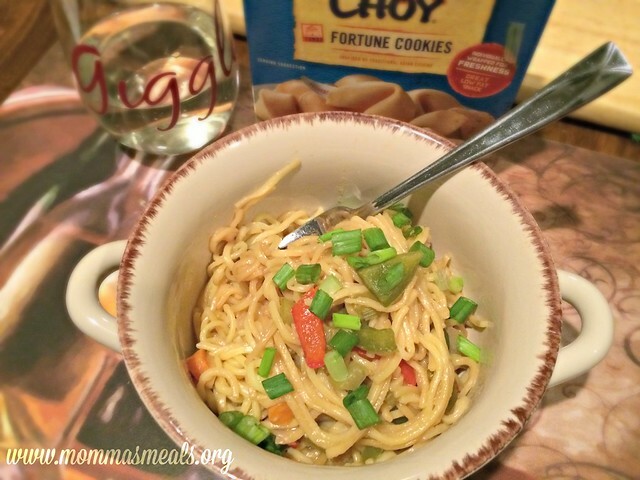 I’ll have to try this.have you tried one pot chicken LO mein? It’s a similar recipe and you boil everything in the same pot. Super easy and family approved.